Your purchase includes a download card included in the package with your order. Dark cabaret artist Aurelio Voltaire leaves the vampires, zombies and murder ballads behind for a heart-wrenching collection of songs about love gained and love lost. His eleventh studio album (and first Projekt release in a decade) sees Voltaire crafting his most mature and passionate release to date. Throughout his 20-year career Voltaire has danced on the dark side with a sardonic smile, penning such tunes as “Zombie Prostitute” “Cannibal Buffet” and “Vampire Club.” He’s best known for “When You’re Evil” (from 1999’s debut The Devil’s Bris), a jaunty celebration of naughtiness befitting a Disney villain (as evidenced by the scores of Disney villain fan videos on youTube set to the song.) Also a classic track, “Brains!” (from 2002’s Boo Hoo) recounts an evil meteor hungry for human brains and was featured on the Cartoon Network show The Grim Adventures of Billy and Mandy. With a reputation for macabre, tongue-in-cheek skewering of everything from religion to the Goth scene to Star Trek and Star Wars, Voltaire has his serious side, too. Every once in a while someone comes along and breaks his heart, and the result is an album of gut-wrenching songs. His 2002 outing, Boo Hoo, was described by Projekt as “a breakup record for lonely hearts with an ax to grind.” Well, it’s happened again! Heart~Shaped Wound goes past an 8.9 on the heartbreak scale. The result of a short but tumultuous three-month relationship – the first after his divorce in 2013 – Voltaire found himself writing new songs that were earnest, brimming with anguish, regret and yearning. Known for releasing an album a year, Aurelio Voltaire spent three years crafting Heart~Shaped Wound in between his hectic touring schedule. Defying classification, the album drifts seamlessly from Goth rock to folk, from saxophone-fueled torch songs to guitar driven indie-rock. There’s even an intense heavy metal ballad, “Leaves in the Stream,” a duet sung with Arch Enemy frontwoman Alissa White-Gluz. Aurelio Voltaire returns to Projekt, bringing with him 20 years of genre-defying musical storytelling. Often sarcastic, sometimes serious, always uniquely… Voltaire. Heart~Shaped Wound began as the product of a short, but tumultuous relationship, the first after Aurelio Voltaire’s divorce from his wife in 2013. In the mere three months of this new relationship, Voltaire found himself writing several songs including the folk love song, “In Disguise” documenting the six times he fell in love with a cosplayer at Dragoncon (a huge fantasy convention in Atlanta, Georgia) not realizing it was the same woman year after year. The song, which is written in the anachronistic European folk style prevalent in his early albums contains not-so-subtle references to the World of Warcraft and League of Legends costumes she wore. “Human Nature,” a more contemporary alternative rock track that explores the issues of having a partner who suppresses their feelings could easily be about Spock. But even the songs that seem to mock an ex lover, like the sarcastic swing track, “A Romantic Guy,” speak more to the faults of the author who states he is a romantic fellow but nothing deeper than that. The album opener, a goth rock track called “The Projectionist,” more than hints at the psychological shortcomings of our protagonist who seems downright nefarious in his sociopathic pursuit of a relationship. It’s not all heartache on Heart~Shaped Wound. You can’t have a break up without falling in love and those moments shine here, too. “Leaves in the Stream” and “Butterfly” are euphoric declarations that love is in the air. And even though it’s a break-up song, Leonard Cohen’s “Hallelujah” is perhaps one of the most beautiful songs written on the topic, and it’s covered here admirably by Aurelio Voltaire. 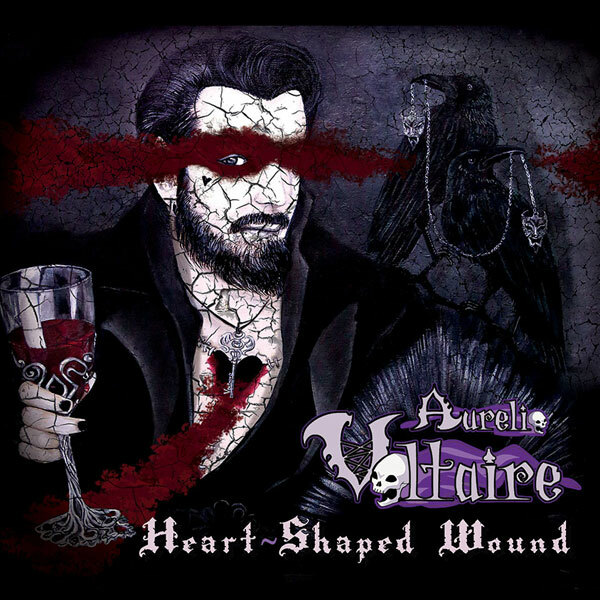 Aurelio Voltaire continues to defy classification on Heart~Shaped Wound, crafting an album that seamlessly drifts from Goth rock to folk, from saxophone fueled torch songs to guitar driven indie-rock. His voice and demeanor seem as comfortable in the sarcasm of the swing track as they do in the earnest heavy metal ballad. Heart~Shaped Wound is Aurelio Voltaire’s 13th full length release and 11th studio album. Aurelio Voltaire is often described as a modern day renaissance man. He is a singer/performer, creator of comic books, animation and toys. An international touring musician, he is at the forefront of the Gothic, Steampunk and Dark Cabaret genres. Aurelio Voltaire headlines some of the biggest horror, sci-fi and comic book conventions as well as Gothic and Steampunk festivals during the past two decades. His music can best be described as a collection of murder ballads and tongue-in-cheek stories of the macabre, with just enough bawdy songs about Star Trek and Star Wars to keep a convention audience rolling in the aisles. Many know him for his songs “Brains!” and “Land of the Dead” from the Cartoon Network show The Grim Adventures of Billy And Mandy. Voltaire’s live shows, whether solo or with his skeletal orchestra, are full of stories and games. Some describe his shows as sitting around a fire while an old friend regales you with tales, presuming that old friend drinks a liter of rum a night, dates zombie prostitutes and wrestles Krakens. Voltaire has been recording and touring for over 20 years. He’s released 13 full length CDs. Recently, Voltaire can be seen in his informative and hilarious YouTube series, Gothic Homemaking. In this show, that can best be described as Pee Wee’s Playhouse for spooky kids, he demonstrates how to turn your boring apartment into a gothic lair with the help of a desiccated co-host, Orville Deadenbacher and a bunch of other recurring monster characters. The Sweet 16 Tour ~ 2017! 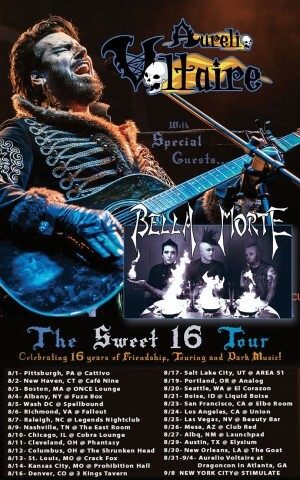 I’m on tour all over the USA right now with my friends Bella Morte! Sixteen years ago, I performed with Bella Morte for the first time at an event called Masquerade 3 in Pittsburgh, PA (with another band we remain friends with, The Cruxshadows). Since then we have crossed paths scores of times and played many shows together. More importantly, we’ve remained the best of friends and collaborate on each other’s projects. I have written the forward in Andy Deane’s books and he has played keyboards on my latest album. After sixteen years of friendship and spooky comradery, we are still going strong! And since we each have new albums on the immediate horizon, we’ve decided to take to the road together for a full US tour. Two of the things we share is that we are among some of the happiest and friendliest spooky dudes you could ever hope to meet. We look forward to sharing our dark but uplifting songs with fans across the country as we celebrate 16 years of friendship, touring and dark music!! !